Francis Bacon is an artist born in Dublin Ireland in 1909 and died of a heart attack in 1992. In 1928 he decided he wanted to be an artist after seeing a Picasso exhibition in Paris. His early work did not get as much success and he destroyed many of his early paintings. In 1944 the exhibition of Three Studies for Figures at the Base of a Crucifixion caused an uproar for its grotesque imagery. This work began the recognizable characteristics of Francis Bacon's work. Oil on Board. Triptych. 1944. Tate, Britain. Bacon's work was always done from photograph, never drawn from life. His imagery is often mutilated, and shows emotional anxiety and alienation. Bacon's work also often draws from Crucifixion and Greek imagery. It is thought that his work has to do with corruption of the human spirit. Oil on canvas. 1953. Des Moines Center, Iowa. 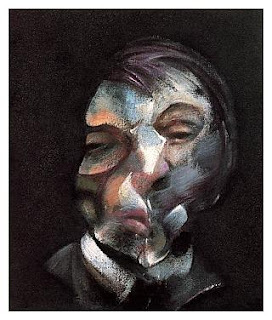 I love the abstraction and heightened emotive quality of Francis Bacon's paintings. The deformed figures and their horrific qualities make them all the more interesting to me. 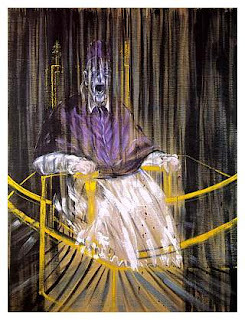 All info and pictures are from this site which does an awesome job of explaining the imagery behind Francis Bacon's work.